also available on Compact Disc by Légère Recordings and P-Vine Records, Japan. 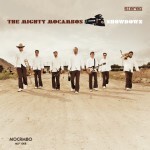 The Mighty Mocambos’ new album “Showdown” sets another cornerstone in their prolific career as a globally active instrumental funk outfit. While maintaining their organic approach of recording real musicians live on tape, the group has refined their trademark sound with a dramatic edge, a hard hitting production and ventures into less obvious musical territories. While highly enjoying themselves as the tight unit they are, The Mighty Mocambos invited an exciting list of guests to contribute to their musical “Showdown”: German film composer icon Peter Thomas, hiphop godfather Afrika Bambaataa, rap legends Charlie Funk aka Afrika Islan (member of the original Rocksteady Crew) and Donald D (of Ice-T’s Rhyme Syndicate), plus Nichola Richards, Shawn Lee, DeRobert from peer label GED Soul in Nashville, Zulu Nation MCs Deejay Snoop & DJ Hektek and organ genius Guillaume Metenier all joined the group for their new musical adventure. 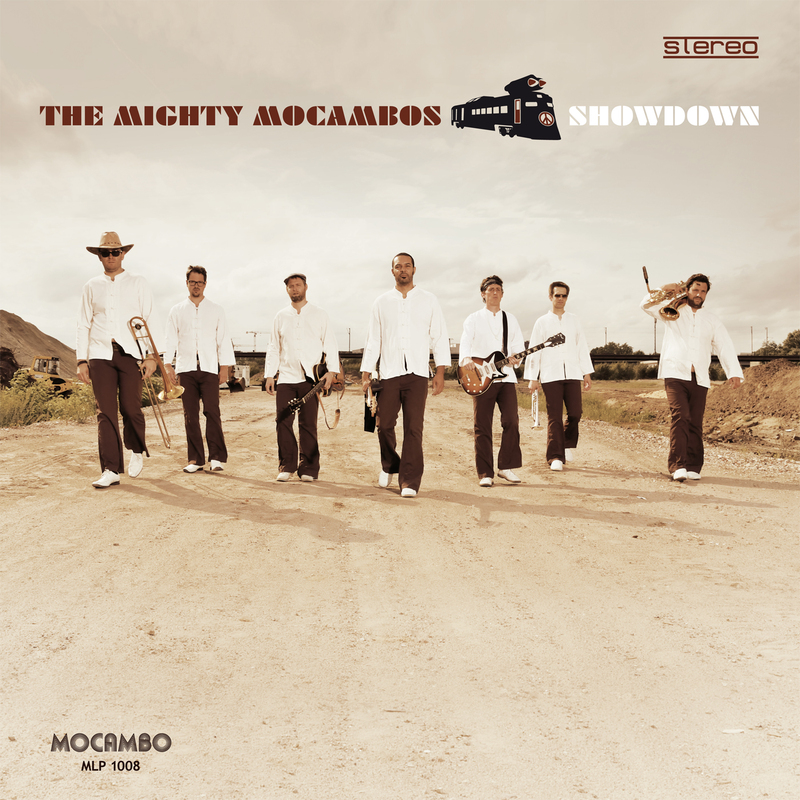 With two highly successful albums under their belt as The Mighty Mocambos and a plethora of singles and music under different monikers such as the Bacao Rhythm & Steel Band, this new full-length is by no means the final battle, indeed the show has just begun. The album shows a group who is prepared to stand up with anyone in the game. Their guns are heavy beats, epic horns, dual guitars and outstanding compositions – and they are locked and loaded. The Showdown theme also reflects our times, and the group continues to spread the vision of “peace, unity, love and having fun(k)” by choosing musical instrumenents as their weapons of choice. The songs come along as coherent as they are diverse in nature. The old school discofied breakdance tune “It’s The Music” and the funked up Rolling Stones cover “Hot Stuff” were released as a vinyl singles before. Both were playlisted by the BBC and have become club favourites by DJs like Craig Charles. Both songs are from the ongoing collaboration with Afrika Bambaataa and Charlie Funk, this time they brought Hektek and Deejay Snoop with them for some chants and talkbox. The epic opening track “Road To Earth” features the one and only Peter Thomas on piano and orchestral arrangements. Thomas wrote over 500 film scores, most widely known are his works for the 60s Sci-Fi series “Space Patrol”, “Chariot Of The Gods” or German cult crime series like “Edgar Wallace”. “In The Dark” introduces young soul singer Nichola Richards with a fine piece of sister funk. Her personal showdown is love-related. “The Spell Of Ra-Orkon” is a sinister afro-funk inspired instrumental with a fantasy score chorus. “Political Power” unites Afrika Bambaataa, Charlie Funk and Donald D for a bold statement against repression by politics and media. “Drifting Stars” is a take on Sixties sci-fi erotica instrumentals from an indie hiphop point of view. “Not Get Caught” is DeRobert (of the DeRobert & the Half Truths) telling a story about committing a crime on a low down funk beat. Dee agruably has the most amazing soul voice of our generation, and it’s hard not to believe his showdown story. “Catfight” is an uptempo soulshaker with a mysterious Eastern flavour and a tripped out downtempo break, featuring well travelled multi-instrumentalist and tiger Shawn Lee on a variety of exotic string instruments. Cats have their showdown too. “Locked And Loaded” is cowbell breaks at their best, another b-boy favourite for a one to one, while the title track was meant to combine spaghetti western and blaxploitation aesthetics with soul drums. It ended up sounding like the Mighty Mocambos with more trumpets, which it actually is, and which is brilliant.